BARCELONA, Spain (AP) — For Lionel Messi, Barcelona's 6-1 win over Sevilla on Wednesday that put it into the Copa del Rey semifinals means his team will aim for nothing less than another treble of titles. Barcelona completed the rare sweep of Copa del Rey, Spanish league and Champions League trophies in 2011 and 2015. Since then it has gone on to win all three editions of the cup and two more La Liga titles, but its failure to repeat in Europe had led to speculation that Barcelona would not prioritize the Copa del Rey this season to save energy. But Barcelona's commanding performance to overturn a 2-0 first-leg loss speaks otherwise. "They said that we didn't want to win this Copa," Messi said. "This team wants to fight for all three competitions. We are in it for everything and don't give anything away." Messi and Luis Suarez both scored late goals with the pair of star strikers back in Barcelona's starting lineup after getting some rest when their teammates lost in Seville. Phillipe Coutinho netted two goals in his best game of an up-and-down season for the Catalan club. 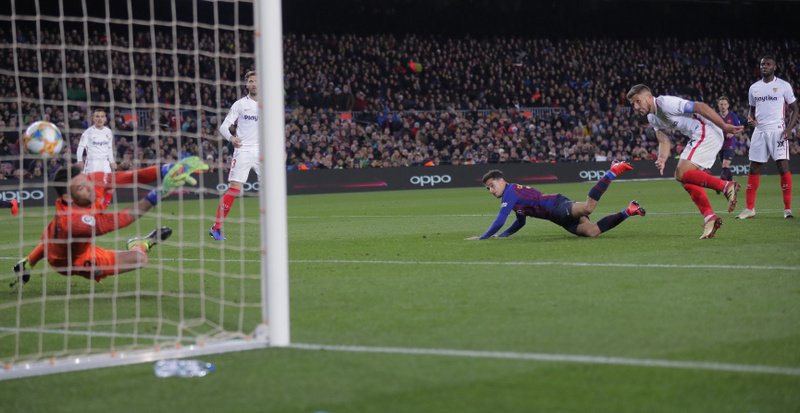 Messi helped Coutinho get going by earning a foul in the area by Quincy Promes, and then stepping aside for his teammate to convert the spot kick. Barcelona goalkeeper Jasper Cillessen, who only regularly starts in the cup, made excellent saves to push Andre Silva close-range shot onto his post and stop Ever Banega's penalty after Gerard Pique fouled Roque Mesa. "Lionel was very generous with his teammate and Coutinho took on the big responsibility to open the scoring," said Barcelona coach Ernesto Valverde. "The penalty saved by Cillessen kept us in the tie. When they took risks with the score 4-1, we found more space and finished them off." Ivan Rakitic turned in a perfectly-weighted long pass by Arthur for Barcelona's second goal in the 31st. Coutinho got his second in the 54th with a glancing header from Suarez's lobbed pass. Sergi Roberto played Messi wide, made a run into the area where Messi had a pass waiting for him to drill in a fourth goal in the 54th. Sevilla wing back Guilherme Arana blasted in a long strike in the 66th to give his team hope until Suarez and Messi rounded off the victory in the final minutes. Messi, who had missed two clear chances, culminated a brilliant buildup to take his haul this season in all competitions to 27 goals. "It is a tough loss," said Sevilla manager Pablo Machin. "It is very hard to head back to Seville after conceding six goals." Coutinho arrived a year ago to Camp Nou after Barcelona paid Liverpool a club record fee of 160 million euros (then $192 million). His erratic play this season had led Valverde to drop him from his group of unquestionable first-choice players, but he has scored in Barcelona's last two Copa del Rey ties to keep it on course to another title. Real Betis scored two goals in extra time to eliminate 10-man Espanyol and advance on a 4-2 aggregate score. Espanyol was leading thanks to Leo Bapistao's headed goal until Giovani Lo Celso leveled in the 76th. Espanyol had Marc Roca sent off stoppage time for second booking before Betis scored twice through Sergio Leon and Aissa Mandi.